One off chance to see Chris Whitelock and witness his extraordinary skills for free! 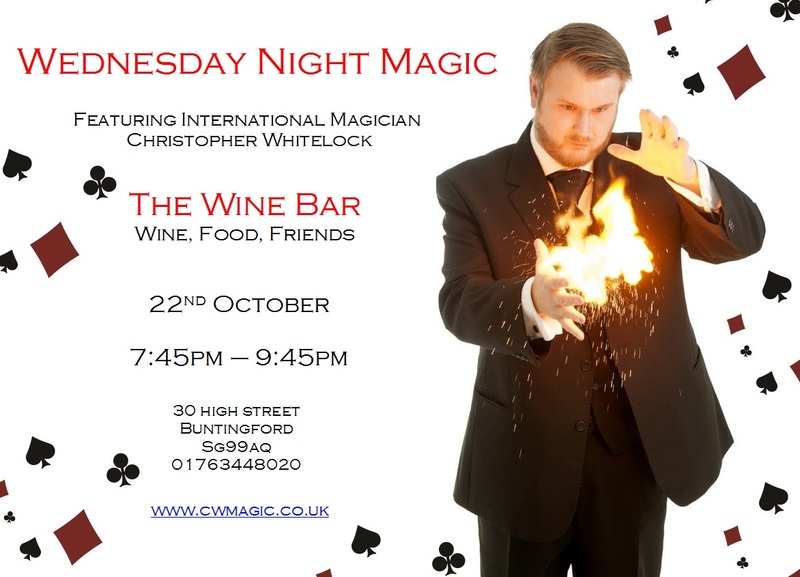 Chris Whitelock will be performing at The Wine Bar in Buntingford from 19.45 on Wednesday the 22nd of October. This is the perfect opportunity for you to witness his jaw dropping magic and mentalism over some great food and drinks. Chris brings a vibrant style to the classic art of magic whilst only being inches away from you, he guarantees to keep you enthralled and entertained. Chris has received outstanding reviews from his previous audiences including Jeremy Clarkson quoting ‘it’s truly baffling’ and ‘all I can say is just wow!’ from Chris Evans Radio 2 DJ. Drop by the Wine Bar at 30 High Street on the 22nd to witness his magic first hand.